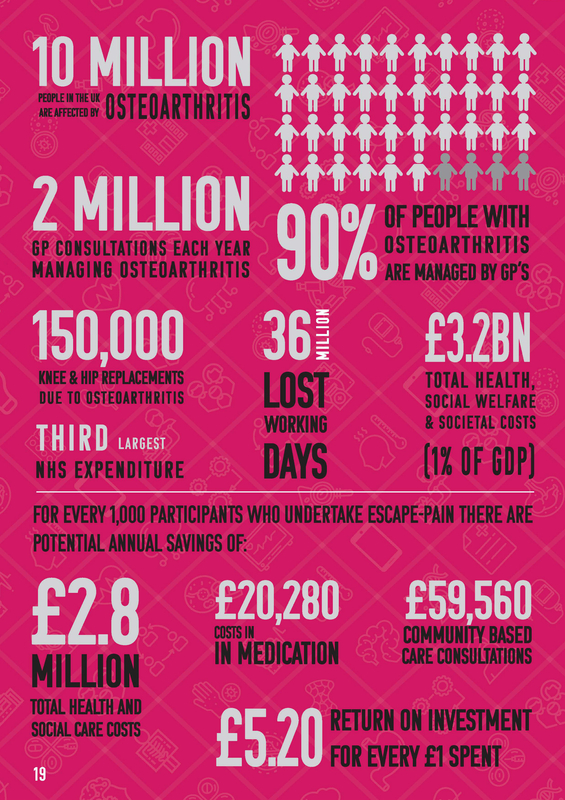 Across the United Kingdom, osteoarthritis (OA) affects nearly 10 million people, causing pain, reduced mobility, impaired physical, mental and emotional well-being, and reduced independence and quality of life. It also increases the risk of co-morbidity and mortality. 90% of people with OA are managed by GPs. It accounts for 2 million GP consultations and approximately 150,000 knee/hip replacements, making it the third largest NHS expenditure. It causes 36million lost working days and accounts for approximately £480 per person per year out-of-pocket expenses. The total health and social welfare and societal costs is £3.2billion, which equates to approximately 1% of GDP. ESCAPE-pain (Enabling self-management and coping of arthritic pain through exercise) is a rehabilitation programme for people with chronic joint pain that integrates core recommendations around self management, coping strategies as well as undertaking exercise. This is an evidence-based, group rehabilitation programme for patients with knee and/or hip osteoarthritis. The AHSN provides training on the programme to physiotherapists or exercise professionals, who deliver it with the support of their local clinical commissioning group (CCG), hospital or community provider. An education component – group themed discussions (led by a supervisor) that covers possible causes of pain, and advice about simple pain management and coping strategies. An exercise component – group participate in personalised progressive exercise regimen to increase strength, endurance and function. Behavioural change component – techniques that subtly challenge erroneous beliefs that physical activity causes and/or exacerbates joint pain. The ESCAPE-pain programme is now increasingly being delivered to people in leisure centres and other community venues and even workplaces, offering easier access away from clinical settings. It is less costly than usual care plans, and generates savings in both primary and secondary care. The robust evidence for ESCAPE-pain shows that people achieve a marked improvement in mobility and pain reduction, and are better able to achieve the activities of everyday life. There is also a marked impact on mood based on anxiety and depression score improvements. Notably, results from the original trial have been replicated in clinical practice, which demonstrates the programme’s efficacy. ESCAPE-pain has already spread to over 70 sites nationally, benefitting more than 6,000 people. It will continue to spread across the country as the AHSN Network supports its wider spread during 2018-2020.